Sylvia Plath once said that. And that’s how I feel about sharing my story with you. I mean, how can I possibly articulate that moment into words? In my mind and in my heart, the memory burns as if it just happened yesterday. I remember every minute detail: how I felt; how he looked; the smell of pine and spruce which surrounded us; the combination of emotions I never before felt at the exact same time; the surprisingly comfortable juxtaposition of happiness, elation and surprise combined with happy tears. Yeah. How do I get all of that into words? I think back to our time in Baltimore … when we first fell in love. I’m not sure if it was him being away and us missing each other, or the magic behind our first getaway and holding hands at the Baltimore harbor line while watching the sunset – but it happened. I remember standing beneath the spotlight of a streetlight on a quiet, dark road as we said goodbye. I was looking at him, listening to him thank me for coming, and just, well, not wanting to leave. It was that hard to say goodbye. And that’s how we knew. 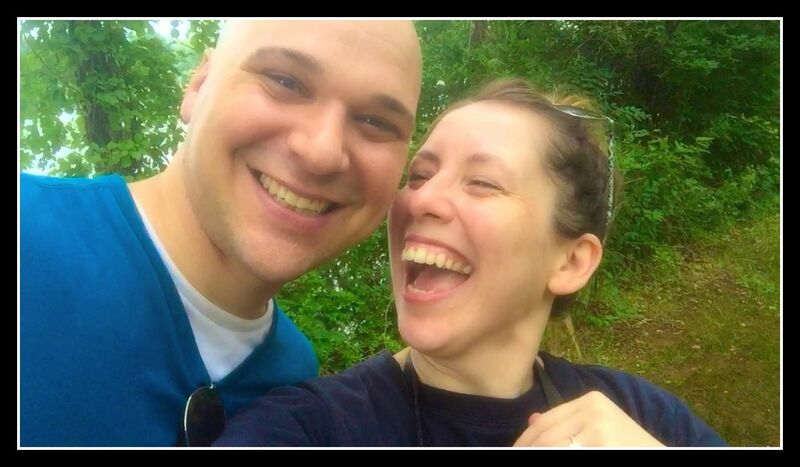 Our relationship essentially began with Brian leaving out-of-state on many occasions for his medical rotations. Naturally, I would follow him. Well, except for that time he went to Oklahoma and forbid me from coming through a presentation with Sweet’N Low sugar packets. Nevertheless, we coined each one of my visits a new “adventure.” And we sure had many of them. We felt the chill of Lake Erie brush our cheeks on a cloudy Saturday afternoon. 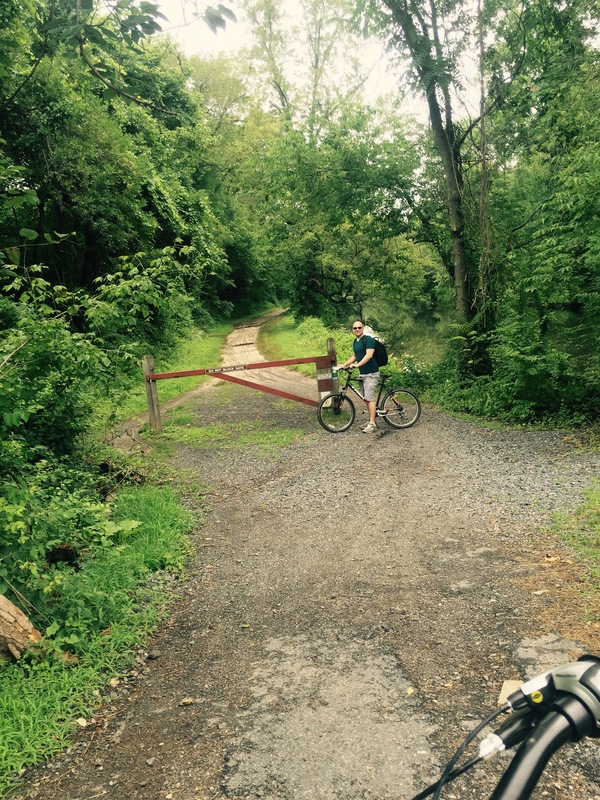 We toured Washington, D.C. We walked the paths of historical arboretums. And in each and every one of these adventures, it wasn’t what we saw that was most important. It was that we fell more and more in love each time. An each time, that small flame which sparked under that solo streetlight in Baltimore swelled with intensity. And then he took me on a new adventure. In hindsight, Brian asked me if I had any inkling as to what the day would hold. I said to him, “If I had any idea, I would have put myself together a little better than I did.” With that said, I got ready that morning with no expectations and, comically, absolutely no makeup. 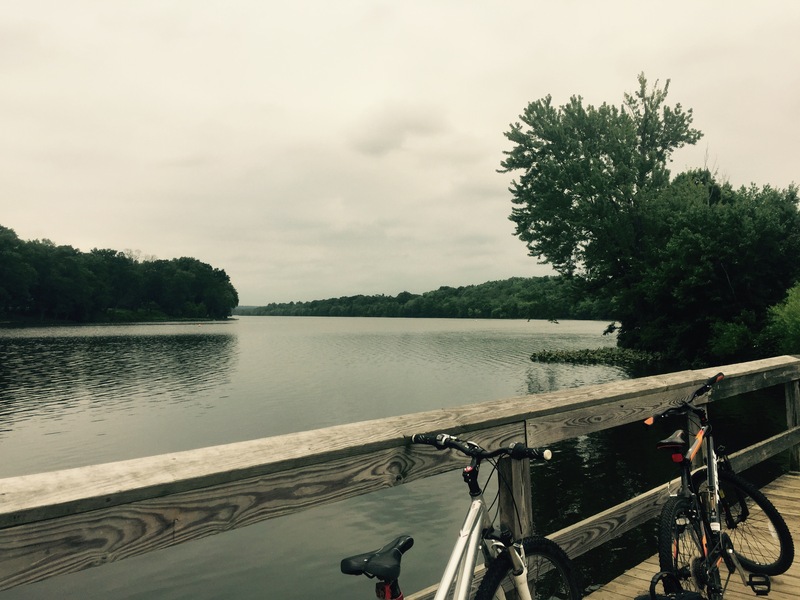 We have been meaning to explore our new neighborhood for quite some time, so we rented two mountain bicycles from Jay’s Cycles on a Saturday afternoon and received directions from the owner to the entrance of the Delaware and Raritan Canal State Park. Helmets on head (well, at least on mine), we were off and coasting past the heart of Princeton, its restaurants and bars and infamous University. And then we arrived at the entrance of the Park with its backdrop of luscious greens, the lingering scent of rain, and the sound of crickets hiding yet chirping in the distance. Brian began throwing many metaphors in my direction, which at the time I attributed to our biking adventure, but which actually represented a grander meaning. Isn’t it better that we embark on this adventure together? No matter what happens on this road, we will conquer it together. Every adventure is better when we experience it together. A few miles in, we arrived at a wooden footbridge overlooking the Millstone River. And for a story perhaps more comical than me being makeup-less was Brian pulling out of his backpack (what I thought) was our only map of the park. One moment, he was holding it and the next, we were following its movement right into the water. Yes. Brian dropped our only map, and as it floated right there on the surface of the water, a stomach-hurting, tear-inducing fit of laughter ensued between us and the passerbys who also witnessed it all. “Now how are we going to find our way?” I asked as we leaned across the wooden railings. “I think I have an extra map somewhere in my bag,” he said calmly. And so we got back on our bikes and continued on our way, leaving the majestic river to disappear behind us. We passed walkers and runners and other bikers who all waved friendly hellos. Berry bushes. Lilly pads. Kayakers coasting through the canal and people watching them from benches along the way. At one point, Brian wanted to rest and so we stopped. As I faced the river and stretched my legs, I heard Brian announce from behind me that he uncovered the extra map. I silently rejoiced with relief. “Why don’t you take this tell us where we are and where we have to go?” I looked at him with that kind of look you give when you tilt your head sideways and your eyeballs rise up to the top of your eyes, that “come on, you’re kidding right” kind of look. I responded candidly, “How am I supposed to figure out where we are? I’m not the best at maps.” He asked me to try and so I did, and unraveled the tri-folds of a piece of paper unknowingly powerful enough to not guide us through the park, but to guide us through the untraveled courses of our future. And that’s when time stood still. Literally. Because what I opened wasn’t a map. It was this picture of Brian. 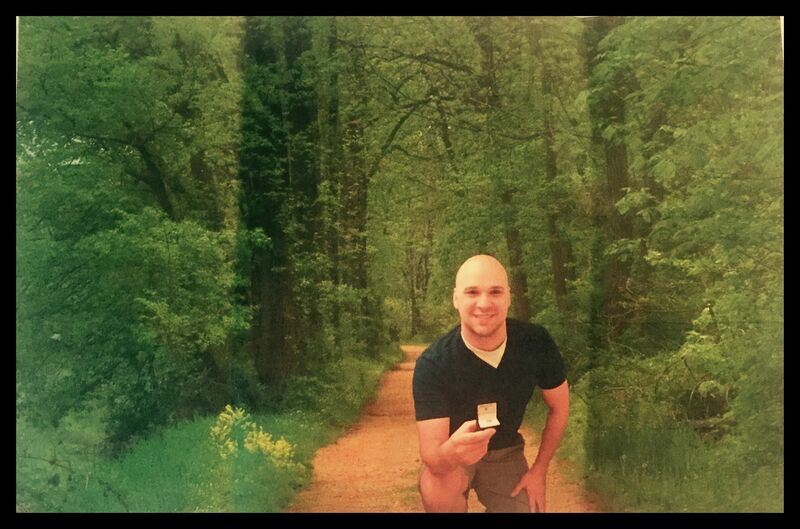 He had photo-shopped himself into the foreground of a picture of the park’s wooded path, on his one knee, presenting an engagement ring. I stood there and studied this “map” for (what felt like) an eternity. Do you remember when I wrote the post on “Flying Time” and I mentioned that a possible key to slowing it down (time, I mean) is to experience more of life’s Firsts? Well, I felt like this theory was being confirmed here, for as I stood there, all of the minute hands of every wall clock in the entire world shut down to give us this moment. It mirrored the techniques used in movies whereby everything but the actors freeze in frame. Here, the birds, the crickets, the joggers and walkers, everything froze in concert except for us. In other words, time stood still. I moved the “map” aside to find Brian, actually on his one knee, presenting an engagement ring. He told me that he loved me. He told me that he wanted to spend the rest of his life with me. He asked me to marry him. And with the inability to verbalize a “yes” due to hysterical tears, I nodded in affirmation. And that was that. We were engaged! I have never felt so happy in my entire life. In fact, I never before experienced a moment where “happy” didn’t quite cut it anymore. It was a moment in which my mind filed through a kaleidoscope of memories within a matter of seconds; of the past’s rights and wrongs and ups and downs and smiles and hurts. It was a moment wherein I felt an immeasurable sense of comfort … that everything is just as it should be; life, him, us, this moment, the past which led us here … everything is just as it should be. So, he asked me a simple question as a smile curved across his face, “Do you want to keep riding?” And we headed back. We headed back as different people than when we arrived. Literally engaged, and figuratively with a new spark about us. And there we were, amongst the trees and the water and the beauty of nature, at the end of another adventure – but at the brink of a new one. In the end, Brian’s metaphors proved to be quite true. Yes, it is better that we embark on this journey together. Yes, no matter what happens, we will tackle it together. Yes, every adventure is better when we experience it together. Thank you so much for all of you who stopped by to read our story. I hope I captured this adventure well enough in writing. As they say, some things are just hard to write about. Thank you, Ken! I appreciate it! Congratulations! Wish you both all the best! Ah, thank you! That means a lot! Aw, that is so sweet. Thank YOU for reading! I was excited to share the story – but certainly not as excited as I felt in that moment 😉 I really appreciate the kind words and well wishes! congratulations and many blessings to both of you. Congratulations! This was so beautifully written! Sara, thank you for the well wishes and for the compliment! It means a lot! Congratulations to you two. Wish you the very best on this wonderful adventure you’ve embarked on. Beautiful moments all the way! I enjoyed reading this. Congratulations to both of you! All the best as you continue on your journey together. Congratulations! So happy for you both. Congratulations! 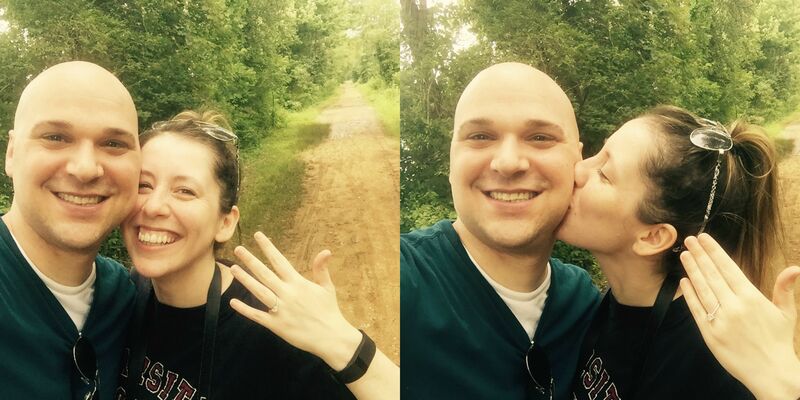 What a beautiful story of your engagement! How superbly wonderful! Congratulations and thank you for sharing your news with all of us. What a beautiful story and so very romantic. Smiles. Much luck to you both. Smiles! Congratulations Olive! I love your story of how he proposed, that’s so romantic! 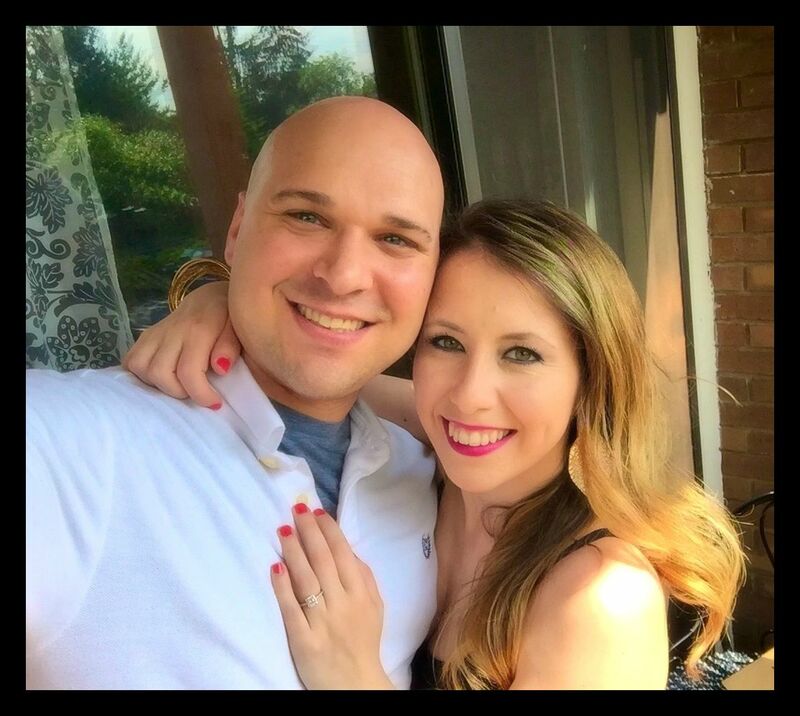 My husband’s proposal wasn’t nearly as romantic or even pre-planned, but it was perfect for us. I’m so happy for you and wish you all the best! Thank you, Kate! That is all that ever matters – that the proposal was special for the two of you. My fiancé’s proposal just suited his creativity and his natural ability to steer me in a completely opposite direction with me being clueless 😉 Thank you for reading and for leaving such kind words. Heart and Harp Strings. I love it. Aw, thank you so much. You know, when writing this post I had the opportunity to share my story with the world. I never expected to receive so many comments from readers telling me that they felt touched by the story. It is so heart warming. Thank you so much for the well wishes. It means a lot! You captured it very well, Olive! Wishing you both much joy and happiness and lots of children!! !